Born and raised in South Florida, Nathan Delinois (Nate Dee) has numerous influences... this includes his Haitian background and the use of color in a lot of Haitian art, as well as in street art. The design quality of the Art Nouveau movement and the drama of Greek art from the Hellenistic. These elements can be seen in his work. Additionally, he takes some influences from the pop surrealists. He has been featured in magazines such as Delve, Making Waves, WeMerge, DUO & the Miami New Times. In 2014 The New Times listed him as one of the 10 Miami Artists to folow on Instagram. In 2013 he was also given an Honorable mention by the magazine for their 2013 Miami Masterminds awards. 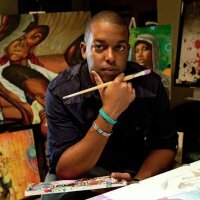 He's been featured on multple blogs and has displayed his work in exhibits throughout South Florida.